Azaleas are evergreen or deciduous members of the genus Rhododendron, but only the deciduous types can be grown in cold climates. Until recently all azaleas sold in Finland were imported from Central Europe. The predominant varieties, Japanese azalea and the Belgian-bred Ghent hybrids are not truly hardy here, except in the very south. An azalea breeding program aiming at winter hardy deciduous cultivars was started at the University of Helsinki in 1988. During the first phase in 1988-89 crosses were made among the bushes proven to be hardy in southern Finland, and additional variation was obtained from Sweden and Minnesota. 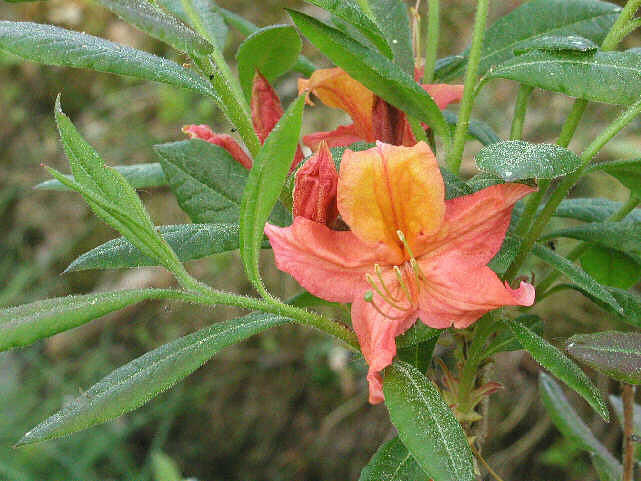 The species Rhododendron canadense, R. molle ssp. japonicum and R. luteum, as well as some hardy hybrids, were used as maternal parents. These and several other hybrids and species were used as pollinators. Three of the used species produced progenies: R. calendulaceum, R. occidentale and R. prinophyllum. More crosses were made in 1992 in Morton Arboretum near Chicago. In the same year hybrid seeds were obtained from the Minnesota Landscape Arboretum. Further crosses were made in 1996 and 1998 among ourown hybrids and between ourown hybrids and good reds from America. The aim of these more recent crosses is to widen the color range beyond the otherwise prevailing yellow and pink shades. A total of 21 000 bushes were planted in the parks of Helsinki and Kotka and in the Arboretum Mustila. In addition, part of the more tender American material was sent to southern Sweden. About half the plants are still alive. It is mainly the dry summers, rather than the winters, that have culled the material. In some places the weeds competed the azaleas out. The progenies from USA tend to acclimate too late in the season. Since 1993 the blooming has sometimes been profuse, sometimes negligible. In addition to flowers and floriferousness, attention is paid to the foliage and to the size and shape of the bush. Azaleas can also display a marvellous bright autumn color. Several dozens of candidates have been chosen. The majority of them will be cloned for testing in different hardiness zones in Finland, possibly also abroad. The best ones will then be released as new cultivars. The first cultivars will be plain yellows, oranges and pinks. Red and white colors were found in the 1992 crosses. They will be cloned later, as well as the multi-colored or otherwise more peculiar ones. The park divisions of Helsinki and Kotka, and the Arboretum Mustila have enabled the experiments to be run on such a large scale. We have provided the plants free, while the receiving organizations plant and take care of them. The cooperation with Minnesota Landscape Arboretum, the home of the Lights azaleas, has been generous in exchanging pollen and seed. The Department of Horticultural Plant Breeding of SLU in Balsgård, Sweden, has become a southern test location for our breeding material. The University of Latvia has bred azaleas since 1957. Their cultivars will be tested here along with our clones. Original text Anu Väinölä 1998, update Kristian Theqvist 2004.